Unlikely most of our integrations, Samsung Health requires you to install our free FitnessSyncer for Android app which, in addition to giving you quick mobile access to your dashboard on the go, will also integrate Samsung Health with the FitnessSyncer Platform. Once in FitnessSyncer for Android, navigate to the Samsung Health section by selecting it from the menu or clicking on the Samsung Health icon. Once there, you may select what type of data you wish to access. As you change these access types, you may be asked to grant permissions to FitnessSyncer to read or write this data. As with our cloud offering, you must accept all requested permissions. 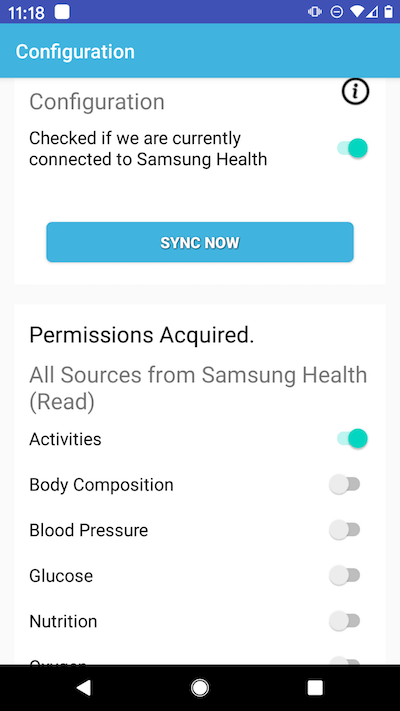 The dialog that comes up from Samsung Health may require scrolling to accept all of the permissions. Once that the permissions are granted, you can then use the “Sync” button which will synchronize the data with FitnessSyncer. To use sources or destinations beyond Samsung Health, you can use the menu and select the Sources and Destinations page where you can add those. FitnessSyncer for Android will either sync your Samsung Health button when you press the “Sync” button or automatically periodically if you are connected to Wi-Fi. To disable the Standard Syncs or change the requirement for Wi-Fi, you can tap the menu selector and select Settings. If you are having issues with remote sync, please ensure that the Launch at Startup and Standard Synchronization are checked and that if you have elected to only sync over Wi-Fi that you are connected to Wi-Fi at the determined sync time. FitnessSyncer Pro users can schedule the periodic syncs by scheduling a Refresh Source Destination Task. If you are having any issues with FitnessSyncer for Android, please make sure that you are using the latest version of FitnessSyncer for Android and Samsung Health. If you receive an error regarding whitelisting and you are on the latest version of Samsung Health, you may need to enable debug mode in Samsung Health for us to work properly. For information, please contact us. I am receiving errors on my Samsung Phone when the device is off. Samsung Galaxy phones optimize the battery usage and turn off applications which run in the background. This can be an issue for applications like ours which work in the background to synchronize while you are away. Fortunately, you can disable this by going into the Settings, select Device Maintenance, select Battery, select Battery Usage, select Optimize Battery Usage, select All Apps, select FitnessSyncer, and ensure that Battery Optimization is not enabled. The Samsung Health steps are different than what I expect. Select “Pause counting steps” from the menu. If you notice dates that are missing and those days have more than 15,000 steps, we recommend that you enable the “Spread Steps over Day?” in the Samsung Health section of the Settings. If you are still seeing dates that are missing, some users have found that restarting their phone can sometimes show the data in Samsung Health. We are working with Samsung to diagnose and improve this. Please note that we will start uploading data only after Samsung Health shows a day with 0 steps, so generally a day after you do the above would be the first day we would upload, but bear in mind that we would only put those steps once we see the next day’s steps for most sources. When I select a Data Type and accept the permissions, the checkbox turns off. Why? Usually this is because that one or more of the required permissions were not accepted. The dialog that Samsung Health shows is scrollable and may have more permissions that you must toggle. If you are still experiencing issues, please contact us. What about Samsung Health for IOS? Sorry but Samsung has not yet provided a sustainable way for us to get to your data on IOS. If you need more information, please do not hesitate to contact us.